Hard to quick smoking or there is still hope ??? Have you ever wanted to quit smoking and convinced yourself than you are destined to smoke cigarettes the rest of your life? Have you ever tried to quit and gave up halfway thought the day or that same night? 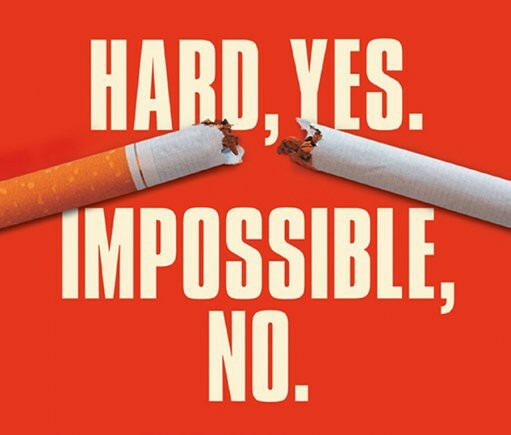 If you think that quitting smoking is just impossible, I would read on. It truly is not as hard as you may think. Take it from a true one packer a day smoker or better on some days. It was like a true friend to me that I couldn't let go. I have smoked a good thirty to thirty six years of my life. I’m not quite sure when I started smoking. I quit one time about ten years ago for a week. The big mistake I made back then was to ask a friend for a smoke so I could see what I was missing. That was a big mistake! I was back full time again and tried several times since and failed on all attempts except the last attempt. Quitting smoking for me was always like a ritual that I attempted two or three times a year. The excuse was always the cost of cigarettes. Never did I complain about the possible ill effects that it could possibly have down the road. Sure I was aware everyday about how bad it was. I heard it on the news every day on how the smokers were getting the boot in restaurants and buildings. The worst people to smoke around were the non-smokers that quit smoking. I know, my wife quit ten years ago. I smoked outside come rain, snow or blizzard. I hope as a non-smoker I never get like that. I was not a very pleasant person to be around when I attempted to quit. I’m sure smokers know how short tempered one can get, when one has not had a cigarette for a while. Every morning I attempted to be a non-smoker, I set myself up for failure by having a coffee and shortly after breakfast I ran around outside hoping to bump into someone who smoked. I always had a nic fit around lunch and dinnertime, only to give in to the craving over and over again. I did not last a good part of a day. I just about gave up trying to quit. I was convinced that I was going to smoke the rest of my life. I thought I was hooked for good, until one sunny afternoon around 3:00pm I had my last cigarette while I was washing my jeep. Everybody tells me that I was ready. I really don’t know if I was ready. What I do know is there are several key things that I had to do to give it up completely, and I am not really sure of the one key thing that kept me a non-smoker two months later. I know that one of the key things that helped was telling myself once and a while that I was a non-smoker even when I knew I smoked. I would not say it out loud if people were around me that knew I smoked. They would probably think I was losing it. I told myself that I was a non-smoker for about two weeks prior to quitting. Self-preparation you may want to call it. I truly knew that I wanted to quit. Maybe I was ready. That sunny afternoon I had one cigarette left which I smoked halfway through washing my jeep. I told my wife that I was not going to buy any more that afternoon. She heard me say that many times before. She told me to give a try and purchase some later and not to be hard on myself for a least trying. Again she repeated it was okay to buy some later. I think my wife just about gave up on me quitting as well. The other key thing to do if you are attempting to quit is to learn how to procrastinate. That same afternoon I kept putting off buying cigarettes until bedtime. Bedtime came and it was too late to go to the store. I put it off until the next morning. Morning came and I convinced myself that I was a non-smoker. I decided the other key thing to do was invite my weaknesses. I had coffee, which they say you shouldn't do. I almost stopped my brother-in-law from coming over that same night because he smoked. I told my wife to have him come over, but he had to smoke outside alone. I thought about it for a moment and decided I was going to stand outside and watch him smoke. They also said not to drink beer or alcohol when you’re attempting to quit smoking. I bought myself a six-pack and drank and watched him smoke. That was the very first day. I finally quit and had no craving the next day. The nic fits were gone! The cravings were gone! The grumpiness from not smoking was gone! The wasted dollars on cigarettes was gone! It was like being born again. The one key goal on quitting smoking for me was to convince myself a couple weeks before, that I was a non-smoker. Quitting halfway through the day was the other key thing to do. Think about that for a second. The day for me was not as long as it would have been if I quit first thing in the morning. When you quit in the morning, you have approximately 16 hours to go before you go to bed and forget about it. I quit at 3:00 in the afternoon with only 8 hours until bedtime to forget about it. It was half the amount of time to put everything to rest. I had a 16-hour jump to get the nicotine out of my system before the morning. Quitting in the morning was always tough before, because smoking and a cup of coffee was always an enjoyment for me. The last key thing to do was just learn to say no for the remainder of the next day. The craving was not as bad as it was on other days that I quit. It must have had something to do with the time I quit. The craving was not as bad as prior attempts. The next day I could not understand why I smoked all that time. The addiction is finally gone and I do not want to pick up that cigarette to see what I am missing! Just convince yourself that you are a non-smoker for approximately two weeks. Finish that last cigarette half way through the day when you are doing something that you enjoy. Make sure you are in a good mood! Do not tell anybody that you’re quitting. Just tell them you are not buying any for the rest of the day. Learn to procrastinate for 6 to 8 hours, which shouldn't be too hard for some of us. Face all your weaknesses that you think will put you back on the smoking train. Say no for one day! Say no for one day! Say no for one day! Day three will set you free!!! Wish you great success in your journey to quit smoking !! !